A human rights campaign group is taking the government to court to try to get legal aid for homeless people. 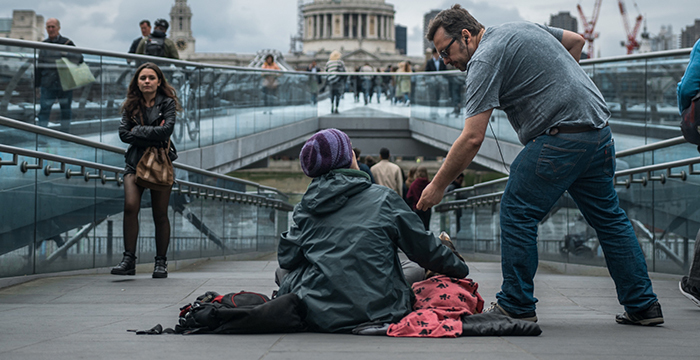 Liberty, which is led by former Doughty Street barrister Martha Spurrier, says that the Legal Aid Agency should fund legal challenges to council orders that target rough sleepers. Public Spaces Protection Orders (PSPOs) allow councils to order people to stop any “activities [that] have had a detrimental effect on the quality of life of those in the locality”. PSPOs are civil orders, but breaching one is a criminal offence. They are one of several different powers that replaced ASBOs, the controversial Anti-Social Behaviour Orders scrapped in 2015. Council bosses argue that measures like PSPOs don’t target rough sleeping, but rather anti-social behaviour (such as street drinking and aggressive begging) often linked to homelessness. Campaigners say that, in practice, the orders are criminalising rough sleeping and unfairly targeting vulnerable people. Stories about beggars been jailed for breaching civil orders have led to accusations that it is increasingly a crime to be poor in Britain. The homelessness charity Crisis says that legal actions against rough sleepers “should be used as a last resort”. That said, Legal Cheek understands that the person represented by Liberty in the case is not actually homeless herself, but a “concerned local” who wants to challenge her council’s clampdown. But Liberty says that the case is about making legal aid available for cases against PSPOs, whether the person applying for it is directly affected or not. The Legal Aid Agency confirmed that challenges to PSPOs do not currently qualify for legal aid unless the applicant can get exceptional case funding. Another 600 people were prosecuted under section 4, which targets rough sleeping (“every person wandering abroad and lodging in any barn or outhouse, or in any deserted or unoccupied building, or in the open air, or under a tent, or in any cart or waggon… shall be deemed a rogue and vagabond”). The post Government sued for denying legal aid to homeless appeared first on Legal Cheek.